Perimeter Church is a large Presbyterian PCA church in north Atlanta. They make their sermons available from their web site and via pod-casting using iTunes. The sermons are some of the best, scriptural based teachings you will find. Most are from lead teacher Randy Pope who founded the church over 25 years ago. 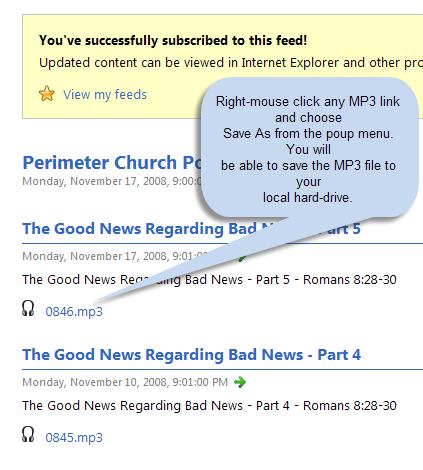 This article explains how to access the online sermons both in streaming format from the church’s site and via downloading MP3s directly to your computer using your browser, Outlook 2007 or any RSS reader. 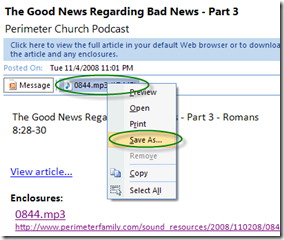 Stream the sermon to your computer – this means you have to be online to listen to it. Use iTunes to listen via or download via Podcasts – preferred if you already have iTunes & iPod. Upload the MP3 to iPod or any generic MP3 player for listening on the go. However, if you prefer to download the MP3 file so you can listen to offline or to upload to a generic MP3 player, this section is for you. 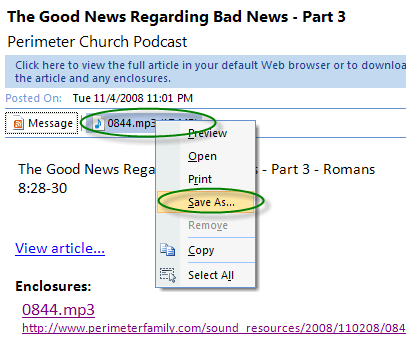 You will see a list all of the sermon titles along with a blue link to the associated MP3 file next to headphones. Put your cursor on the link and right-mouse click, then choose Save As you will be able to save the MP3 file anywhere on your hard-drive. I suggest saving it to your My Music folder. This image is how it might look in Internet Explorer 7 (IE 7). This is how the popup menu looks in IE 7. Firefox or other browsers should be similar. 2) You can also subscribe to the downloads meaning you can always get to this updated list from IE 7 or from Outlook 2007. This is called RSS feeds or subscriptions. You probably see the RSS name and logo on lots of sites. Here is how to subscribe to both IE 7 and Outlook 2007. In Internet Explorer 7 (IE 7), you can access this new updated list anytime by clicking the gold star on the left side of your tab bar, then the feeds button. 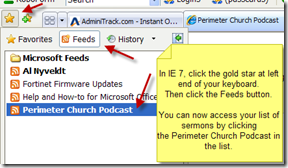 Perimeter Church Podcast will appear in list so just click that view your listing. Finally, if you have Outlook 2007, this subscription will also appear in your RSS feeds there as well. Scroll down your list of folders and click on the RSS Feeds folder. Now you will see the Perimeter Church Podcast appear there too. Click on it and all of the sermons will appear in your emails area. 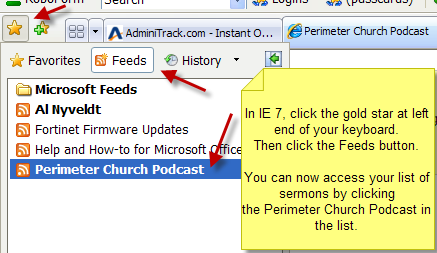 Just click on any sermon so that is appears in your preview window. The MP3 will appear as an attachment. Simply right-mouse click on the attachment and download as you would any attachment.